Does your travel medical insurance cover evacuations? To be prepared for a medical emergency abroad, it is a good idea to have travel medical insurance to make sure that the cost of any emergency care you need while you are traveling is covered. 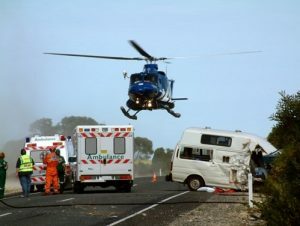 However, when picking a policy, it is also important to know whether it will cover the cost of transport to the hospital or out of the country, either by ambulance or by air. Injuries related to travel-specific circumstances, such as high-risk activities like parasailing or bungee jumping. When working with our members, we ensure that there is appropriate insurance coverage to facilitate and cover the cost of evacuation should it be needed. Two cases that highlight the benefits of having medical evacuation coverage stand out. I remember helping a patient who had hurt his back in a skiing accident in Japan. Because the small medical facility he initially went to was not equipped to meet his injury’s needs, he had to be transported to a larger hospital. Because he had medical evacuation insurance, the process was smooth and he saved $104,000 in transport costs. In one other case, a college student in Colorado visited a local hospital with a fever and headache. At our direction, the treating hospital did an MRI and spinal tap and diagnosed him with West Nile Encephalitis. Knowing that this was likely to get worse, we worked to transport this student to a facility with a higher level of service. Doctors there treated him in the neuro ICU for 2 weeks before he was stable and able to move to a regular room. Because the student was studying at a college more than 50 miles from home, and as a result of his benefits plan, his transfer to a top national hospital incurred no cost to him. Every medical emergency deserves the top level of care, but you shouldn’t have to face a heavy financial burden for needing transport. Before you travel, compare comprehensive medical travel and evacuation plans and choose the one that best fits your health situation and the issues that may arise at your destination. To learn more about how to better prepare yourself medically to manage your health when abroad, click here.